Upper and Lowercase Letter Matching with a Box! 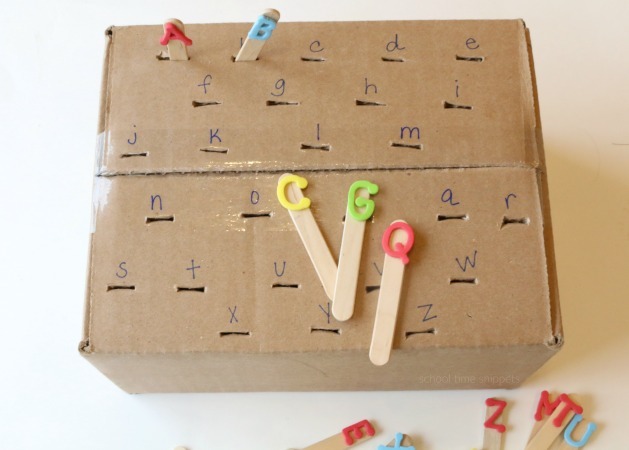 Set up this simple matching upper and lowercase letters activity using a recycled box! This fun, hands-on letter recognition activity is a great way to also work on fine motor skills with toddlers and/or preschoolers! Working on letter recognition with your little one? Get rid of the flashcards, worksheets, and other nonsense and grab an empty box!! Ha! Random, but haven't you ever noticed that kids can have plenty of "toys" all around them, but bring in a box from the garage and they simply cannot stop playing with it?! The box then becomes a car or space ship, a bed for a stuffed animal, or a fun "toy" to push around the house?! Have you had the same experience? 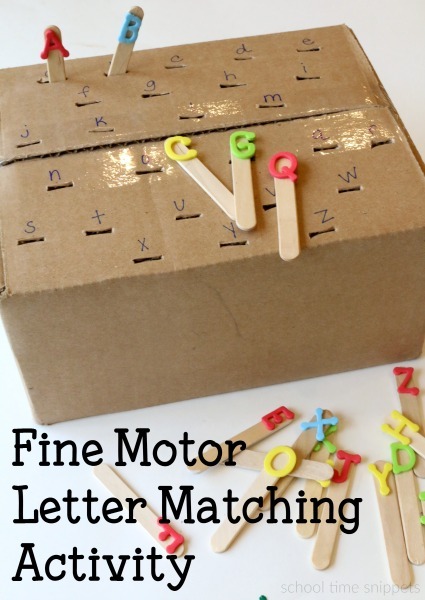 Well anyways, this simple, hands-on matching letters activity can be re-used over and over again. This letter recognition activity also works on those important fine motor skills. It can be set up various ways depending on your child's skill level: alphabetical order, uppercase/ lowercase letter recognition, sequencing, etc! With just a few minutes of prep you'll have a great activity focusing on the alphabet and fine motor skills! 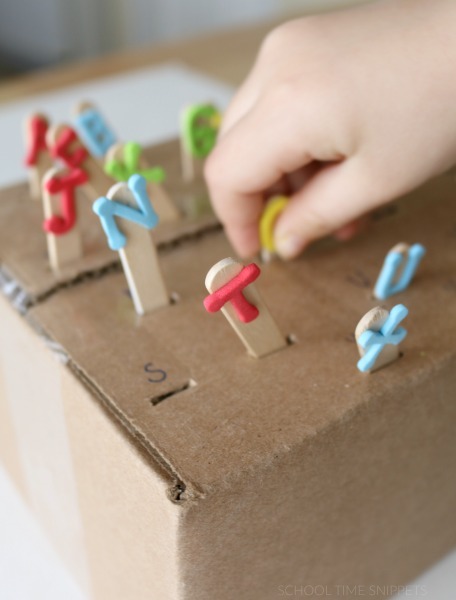 Take a few minutes to prep this activity away from the kids as you'll be using a knife to puncture slits in the empty box; grab that empty shoebox or Amazon box from the trash pile and upcycle it for this fun matching letters activity. On one side of the box, puncture 26 holes-- large enough for your child to insert a craft stick. Above each slit, write a letter of the alphabet. Go in alphabetical order... or choose to write the letters in random order. Next, have your children help adhere the foam letter stickers to the top of each craft stick. If you do not have foam letters, just write the letter on the craft stick with a marker. I made up this fine motor alphabet activity to work on upper and lowercase letter recognition and matching for my 3 and 5 year old. However, you could easily make this activity to work on just lowercase letters or uppercase letters. Set this activity up to meet the skill ability of your child. On the box above each slit, I wrote a lowercase letter. Your letter matching box is all done! Now it is time to learn and play! Once the box and craft sticks are ready to go, have your child match the letter on the craft stick to the letter on the box by pushing the craft stick into the slit. Continue until all the letters have been matched! My littles just LOVED this matching upper and lowercase letters activity! Such a great and simple fine motor activity for little hands! Another fun way to work on these fine motor skills and ABC's is using LEGOS, too! Or try this ABC Basketball Game to add some movement to your learning activities! We love simple ways to learn and play! If you try this activity today, I'd love to hear from you! Leave a comment or post a picture on our Facebook page! Works on Fine Motor Skills! Is versatile! Can be set up for a variety of other concepts, too! In the Fall, we switched this activity up and used pumpkins to work on number recognition >> Check out our Number Sequencing Pumpkin Patch! Teach Your Preschooler with our Preschool Lesson Plans! If you have a preschooler and are searching for more fun lesson plans all ready planned out for you, check out our latest collaborative project: 20 Preschool Unit Lesson Plans that can be purchased in a bundle or individually. 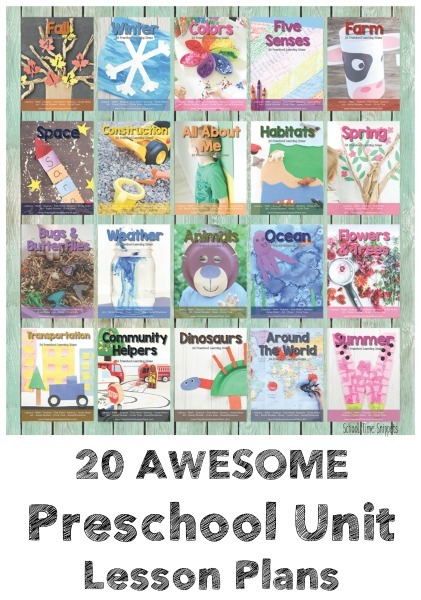 Each unit contains 25 ideas in math, reading, art, science, circle time, etc. etc!! Click to learn more about what each preschool unit offers! We have themes from Around the World, Dinosaurs, Transportation, Colors, and more!! !